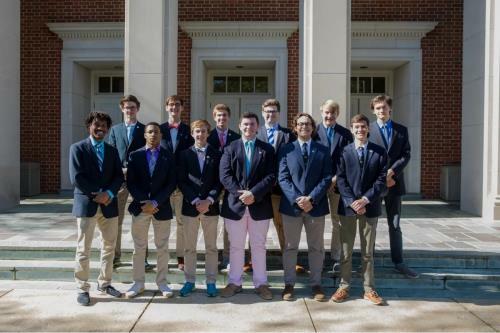 Keo-Kio, McCallie’s preeminent senior leadership organization, welcomed 12 new members from the Class of 2020, inviting juniors to join the group in a Chapel ceremony. The senior leadership organization honors students for their leadership, service and loyalty to the school and its abiding principles. One of the school’s oldest organizations, Keo-Kio is instrumental in planning annual events such as the winter semi-formal dance, Duck Day, community service projects and supporting new campus activities. The group also raises funds and distributes them to events and efforts made by other organizations at the school. Bennett Brock, Lookout Mountain, Ga.
Nate Dallimore, Lookout Mountain, Tn. Brown Hayes, Lookout Mountain, Ga.
Noah Risley, Fort Smith, Ar. Jack Young, Lookout Mountain, Ga. These young men will be the leaders of the rising senior class for th 2019-20 school year, and will help lead their classmates in service to others and devotion to McCallie School.